Dr. Edward Cronly Elliott, 82, retired Lexington dentist, died at 11:10 a.m. yesterday at the Good Samaritan Hospital after a long illness. He lived at 8 Mentelle Park. Born in Lexington, he was a son of the late Richard Gill and Susan Francis Lyon Elliott. He attended Lexington public schools, was graduated from the University of Kentucky and received his dental training at the Louisville School of Dentistry. At UK, Dr. Elliott was a member of the football, basketball and baseball teams from 1898 through 1902. He was a member of the city bowling league for 30 years and held a record at the YMCA alleys with a score of 277 and at the Ammerman Alleys with 288. Dr. Elliott was a charter member and past president of the Lexington Kiwanis Club, a former member of the YMCA board, past president of the Blue Grass Dental Society and held membership in the state and national dental societies. He practiced dentistry for 52 years, prior to his retirement in 1958. Dr. Elliott was a member of Merrick Lodge No. 31. IOOF. and served as representative to the Odd Fellows Grand Lodge and Grand Encampment for many years. He was a past grand national alumni secretary for Pi Kappa Alpha social fraternity and a former member of the executive committee of the University of Kentucky Alumni Association. He was a deacon at Calvary Baptist Church and taught the R.G. Elliott class there for 35 years, the same class his father taught for 35 years. Survivors include his wife, Mrs. Mary Louise Love Elliott; a daughter, Mrs. Edwin R. McClelland, St. Albans, W.Va., and seven grandchildren. Edward Cronly Elliott III, John Prentice O'Rear Elliott, Richard Gill Elliott II and Mary Louise Elliott, all of Lexington, and Edwin Rhodes McClellan, Richard Elliott McClelland and Robert Love McClelland, all of St. Albans. The body was taken to the W.R. Milward Mortuary - Broadway where services will be conducted at 11 a.m. Thursday by the Rev. 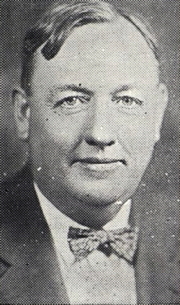 Franklin Owen. Burial will be in the Lexington Cemetery. Friends may call at the mortuary after noon today.